Serzh Sargsyan had been president since 2008 before switching jobs when his second term ended. Eleven days of protests prompted him to step down. This is Serzh Sargsyan. For seven days, he was the prime minister of Armenia. But he stepped down Monday in the face of widespread protests. "I am addressing you for the last time as leader of the country," Sargsyan's statement to the Armenian people read. "The situation has several solutions, but I will not take any of them. That is not mine. I am leaving office of the country’s leader, of Prime Minister." Things didn't have to go this way for Sargsyan, who finished his second term as president April 9 and was appointed prime minister last Tuesday. The shift comes after the country decided to change from a presidential system of government to a parliamentary one, giving more power to the prime minister in the process. While he was still president, preparing to leave office for the first time since 2008, Sargysan insisted he had no interest in the position. But he didn't exactly put up a struggle when the parliament voted him prime minister last week. 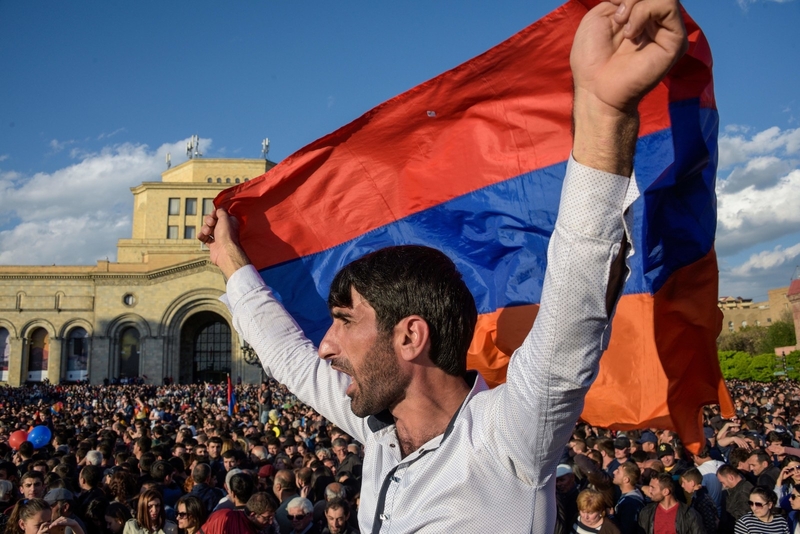 That all worked out fine for Russia, one of Armenia's closest allies in the years after the country declared independence from the Soviet Union. Russian President Vladimir Putin has an interest in ~continuity and stability~ in Russia's sphere of influence and Armenia is no exception. Armenia, for its part, appreciates Russia's support in its ongoing struggle with its neighbor, Azerbaijan. The two have been locked in a frozen struggle over the Nagorno-Karabakh territory for decades now and Russia has promised to defend Armenia in the event of an attack. 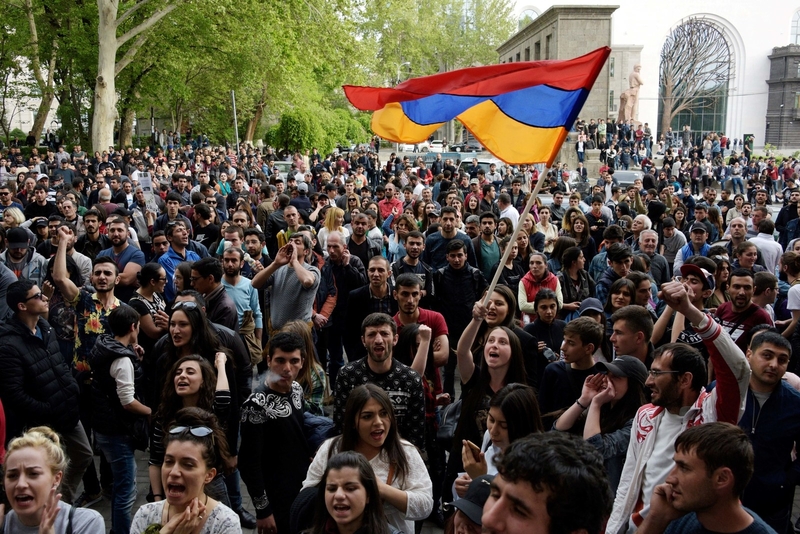 But the Armenian people were less than enthused about what was seen as a power-grab on Sargsyan's part, and even before he was confirmed, people had taken to the streets. Over the space of ten days, more than 200 people were detained by the police in an attempt to quash the protests. 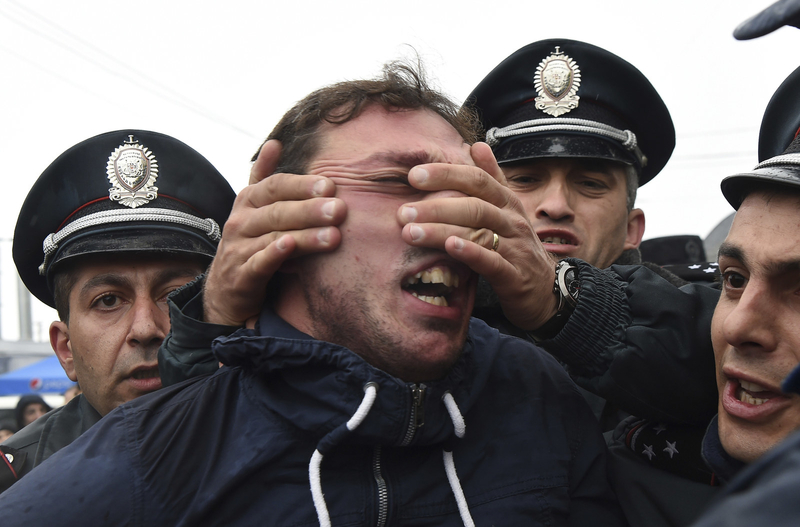 Among those detained was MP Nikol Pashinyan, an opposition leader who has been at the forefront of the protests. After a televised meeting with Sargysan on Sunday, where he called for the prime minister's resignation, Pashinyan was taken into police custody. That didn't stop the protests from growing, and Monday, members of the military appeared to join in. The apparently unarmed soldiers stood at the head of the crowd, linking arms with supporters and looking generally uninterested in dispersing them. The defense ministry wasn't pleased with this turn of events, warning that the soldiers who'd taken part would be punished and that Azerbaijan was watching with interest. “The enemy is looking at events in our country. Instability inside our country opens a road for them to take action. We need to tell society about this,” Defense Minister Vigen Sargsyan said in a statement. 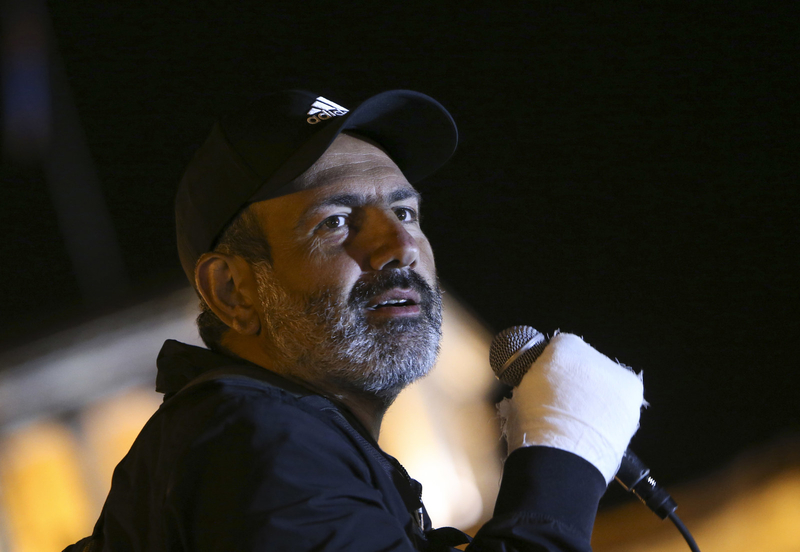 Pashinyan was released Monday and immediately joined the protests, where he was greeted with people chanting his name. 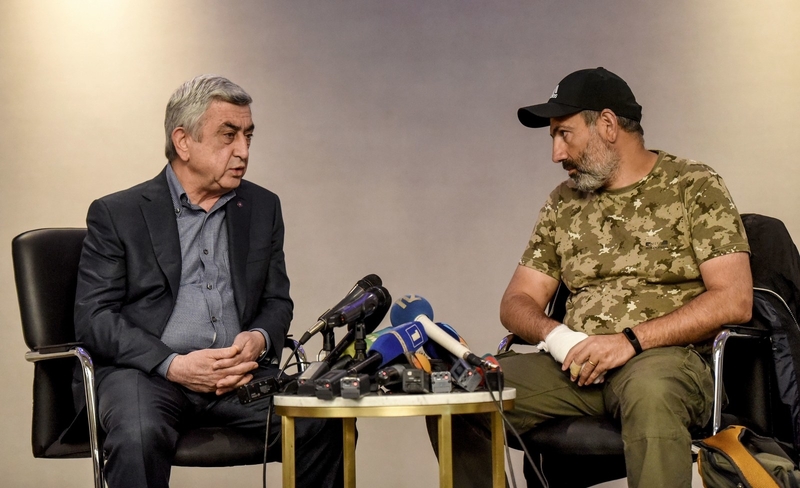 In his statement, Serzh Sargsyan specifically mentioned his opponent, saying "Nikol Pashinyan was right. I was wrong." 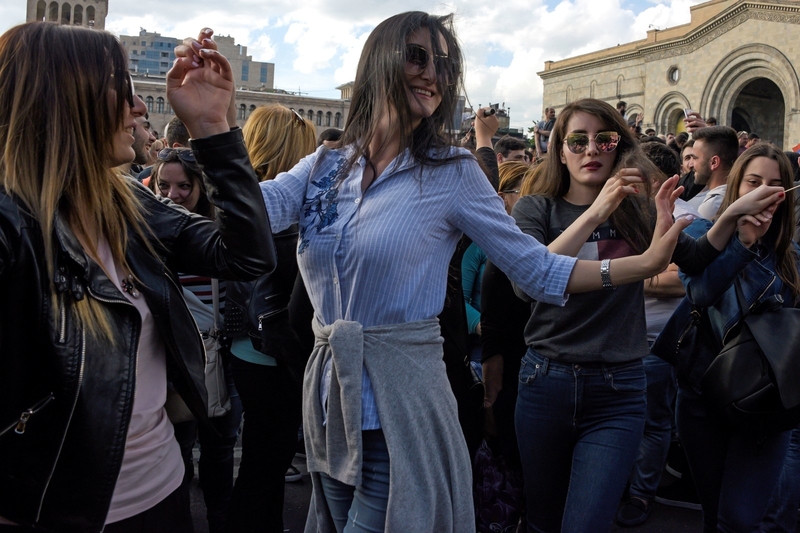 When the crowds on the streets of Yerevan, Armenia's capital, learned about Sargsyan's resignation, people immediately started celebrating. All in all, it seemed like a success of what Pashinyan had dubbed a "non-violent velvet revolution" at the protests' outset 11 days ago. But what about Russia? Moscow tends to get extremely nervous when it comes to protests in its backyard, especially ones that look like they're set to overthrow a leader. Well, in this case, Russia has been extremely chill about the whole thing. The matter is "exclusively an internal affair," Putin's spokesperson, Dmitry Peskov, told reporters Monday, saying Russia stepping in would be "absolutely inappropriate." Why is Russia so calm though? Enter Karen Karapetyan, the former prime minister and now-acting PM after Sargsyan stepped down. Karapetyan, a former mayor of Yerevan, was prime minister from 2016 until Sargsyan stepped in last week. In between his time as mayor and prime minister, he spent some time as an executive at a little business called Gazprom, Russia's state-owned oil company. That — and Karapetyan's relationship with Sargsyan has to leave Moscow feeling pretty assured that Armenia's pro-Russia stance isn't likely to change anytime soon. So yes, protests managed to bring down a leader many saw as acting corruptly! But the government as a whole remains the same and while elections haven't been called yet, the winner will likely continue a lot of Sargsyan's policies.